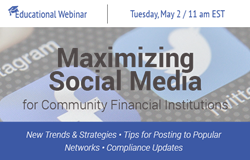 BSG Financial Group, a leading provider of revenue-enhancement programs and compliance solutions for financial institutions nationwide, will host a webinar on Tuesday, May 2 at 11 a.m. EST entitled, "Maximizing Social Media for Community Financial Institutions." The free session—which is part of an ongoing educational webinar series that the company provides for its clients and potential customers—will provide strategies for community institutions to enhance their social media efforts by capitalizing on new trends and strategies. The webinar—especially relevant to bank and credit union Marketing, Social Media and Compliance officers and teams—will explore new trends in social media marketing, review the most popular social media platforms, and provide tips and strategies that can streamline efforts and optimize messaging. The webinar will also present a review of compliance concerns that are relevant to financial institutions, regardless of the sophistication their social media efforts. The webinar presenter is Sara Harris, Administrative Director for Insight CRM Solutions, developer of Social IQ™, a social media management software system for community financial institutions. Attendees to the webinar will also be eligible to receive a free 60-day trial of Social IQ™–an online social media management platform for financial institutions–by registering for a no-obligation software demo after the webinar. Insight CRM Solutions introduced Social IQ to assist financial institutions in managing their risk assessment strategy surrounding social media compliance. By implementing Social IQ, financial institutions can more easily comply with regulatory requirements, allowing them to actively participate in social media without the risk of incurring compliance violations. For more information about the company, visit http://www.insightcrmsolutions.com.